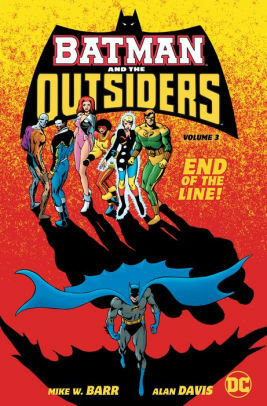 The alliance between Batman and the Outsiders has always been an uneasy one...with tensions mounting, a secret will come to light that could spell the end of the Outsiders! Acclaimed writer Mike W. Barr (Batman: Son of the Demon) concludes his game changing run on Batman and the Outsiders in just the way you would expect. With a bang! After Halo gets mixed up with a mysterious cult, Batman and the Outsiders are thrust into a battle with the villainous mastermind Kobra that will take them into the far reaches of outer space! And when Emily Briggs is abducted, Batman and the Outsiders will discover a long-buried secret from her past that will shake the team to its core. Will Batman and the Outsiders be able to overcome these new revelations? Or will they decide it's time to call it quits one and for all? Collects Batman and the Outsiders #24-32, Batman and the Outsiders Annual #2, DC Comics Presents #83 and excerpts from Who's Who #12-15.